Jumu'ah (Arabic: صلاة الجمعة ‎‎, ṣalāt al-jum`ah, "Friday prayer"; Persian: نماز جمعه‎‎, Namaz Jumah; Turkish: Cuma Namazı, Juma Namazi), is a congregational prayer (ṣalāt) that Muslims hold every Friday, just after noon instead of the Zuhr prayer. Muslims pray ordinarily five times each day according to the sun's sky path regardless of time zones. O ye who believe! When the call is proclaimed to prayer on Friday (the Day of Assembly, yawm al-jumu'ah), hasten earnestly to the Remembrance of Allah, and leave off business (and traffic): That is best for you if ye but knew! The Prophet said, "On every Friday the angels take their stand at every gate of the mosques to write the names of the people chronologically (i.e. according to the time of their arrival for the Friday prayer) and when the Imam sits (on the pulpit) they fold up their scrolls and get ready to listen to the sermon." 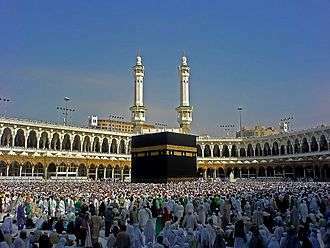 Muslim ibn al-Hajjaj an-Naysaburi relates that the Islamic prophet Muhammad used to read Surah 87 (Al-Ala) and Surah 88, (Al-Ghashiya), in Eid Prayers and also in Friday prayers. If one of the festivals fell on a Friday, Muhammad would have made sure to read these two Surahs in the prayers. Muhammad is quoted as saying “The best day the sun rises over is Friday; on it Allah created Adam. On it, he was made to enter paradise, on it he was expelled from it, and the Last Hour will take place on no other day than Friday.”[ Ahmad and At-At-Tirmithi]. Abu Hurayrah also quoted Muhammad: “Any man who performs Ghusl on Friday, perfumes himself if he has perfume, wears the best of his clothes, then goes to the mosque and offers as many prayers as he wishes while not harming anybody, then listens quietly while the Imam speaks until he offers the prayer, will have all his sins between that Friday and the next forgiven.” [Al-Bukhari]. Aws ibn Aws, narrated that Muhammad said: “Whoever performs Ghusl on Friday and causes (his wife) to do ghusl, then goes early to the mosque and attends from the beginning of the Khutbah and draws near to the Imam and listens to him attentively, Allah will give him the full reward of fasting all the days of a year and observing night-vigil on each of its nights for every step that he took towards the mosque.”[Ibn Khuzaymah, Ahmad]. Further, Muhammed said “Any Muslim who dies during the day or night of Friday will be protected by Allah from the trial of the grave.” [At-Tirmithi and Ahmad]. The jumuʿah prayer is half the ẓuhr (dhuhr) prayer, for convenience, preceded by a khuṭbah (a sermon as a technical replacement of the two reduced rakaʿāt of the ordinary ẓuhr (dhuhr) prayer), and followed by a congregational prayer, led by the imām. In most cases the khaṭīb also serves as the imam. Attendance is strictly incumbent upon all adult males who are legal residents of the locality. The muezzin (muʾadhdhin) makes the call to prayer, called the adhan, usually 15–20 minutes prior to the start of Jum'ah. When the khaṭīb takes his place on the minbar, a second adhan is made. The khaṭīb is supposed to deliver two sermons, stopping and sitting briefly between them. In practice, the first sermon is longer and contains most of the content. The second sermon is very brief and concludes with a dua, after which the muezzin calls the iqāmah. This signals the start of the main two rak'at prayer of Jumu'ah. Friday prayer in University of Tehran, Iran. In Shia Islam, Jumu'ah Salat is wajib-e takhyeri, meaning it is obligatory but optional at the same time; that is if a person prays the Friday prayer, he does not have to pray (al-asr) Noon prayer but you can still pray the two left rakats of asr as Sunnat. Friday prayers consists of 2 Rak'ats like Fajr prayers. The difference between these two prayers is that Namaz-e-Jumuah has two sermons before it. Namaz-e-Jumuah is Wajib Takhyiri, which means that we have an option to offer Jumuah prayers, if its necessary conditions are fulfilled, or to offer Zuhr prayers. Hence, if Namaz-e-Jumuah is offered then it is not necessary to offer Zuhr prayer. If the distance between the two mosques is one Farsakh (5/5 km approximately) or more, the prayers are in order. Friday prayer is Wajib Takhyiri, which means that we have an option to offer Jumuah prayers, if its necessary conditions are met or to offer Zuhr prayers. Hence, if Namaz-e-Jumuah is offered, it is not necessary to offer Zuhr prayer. It is also recommended by Shiite Scholars to attend Jumu'ah as it will become Wajib after the appearance of Imam al-Mahdi and Jesus Christ (Isa). Historically, Shiite clergy discouraged Shiites from attending Friday prayers. According to them, communal Friday prayers with a sermon were wrong and had lapsed (along with other religious practices) until the return of their 12th Imam, Muhammad al-Mahdi. However, among others, Shiite modernist Muhammad ibn Muhammad Mahdi al-Khalisi (1890-1963) demanded that Shiites should more carefully observe Friday prayers in a step to bridge the gap with Sunnis. Later, the practice of communal Friday prayers was developed, and became standard there-afterwards, by Ruhollah Khomeini in Iran and later by Mohammad Mohammad Sadeq al-Sadr in Iraq. They justified the practice under the newly promoted Guardianship of the Islamic Jurists doctrine. When al-Sadr installed Friday prayer imams in Shia-majority areas—a practice not traditional in Iraqi Shiism and considered "revolutionary, if not heretical"—it put him at odds with the Shia religious establishment in Najaf. Under both Khomeini and al-Sadr, political sermons would be heard. The communal prayers have higher compliance of worshipers, as compared to the non-communal ritual prayers. In Turkey for example, the ritual prayers are performed regularly by 44% of the whole adult population, whereas Friday prayers were regularly attended by 56% (25% responded that they sometimes attended and 19% that they didn't). According to surveys conducted by Iran's Ministry of Culture and Guidance, less than 1.4% of Iranians attend Friday prayers. ↑ "Dar ul Haqq Islamic Institute - Masjed At Taqwaa". Reno Mosque. Retrieved 28 September 2012. ↑ Margoliouth, G. (2003). "Sabbath (Muhammadan)". In Hastings, James. Encyclopedia of Religion and Ethics. 20. Selbie, John A., contrib. Kessinger Publishing. pp. 893–894. ISBN 978-0-7661-3698-4. Retrieved 17 March 2009. ↑ Gilles Kepel (2004). The War for Muslim Minds: Islam and the West (illustrated ed.). Harvard University Press. p. 226. ISBN 9780674015753. ↑ Jonathan Steele (12 Jan 2008). Defeat: Why They Lost Iraq. I.B.Tauris. p. 96. ISBN 9780857712004. ↑ Brunner, Rainer; Ende, Werner, eds. (1 Jan 2001). The Twelver Shia in Modern Times: Religious Culture and Political History (illustrated ed.). BRILL. p. 178. ISBN 9789004118034. ↑ Joel Rayburn (1 Aug 2014). Iraq after America: Strongmen, Sectarians, Resistance. Hoover Institution Press. p. 173. ISBN 9780817916947. ↑ "Religion, Secularism and the Veil in Daily Life" (PDF). KONDA Research and Consultancy. 8 September 2007. Archived from the original (PDF) on 24 November 2010. ↑ Russ Kick; Nasrin Alavi (1 Jun 2007). Kick, Russ, ed. Everything You Know About God Is Wrong: The Disinformation Guide to Religion. Reformation Hymns: Islam, Iran, and Blogs: Red Wheel Weiser. ISBN 9781934708378. Yet according to surveys by Iran's own Ministry of Culture and Guidance, fewer than 1.4 percent of the population actually bothers to attend Friday prayers. Wikimedia Commons has media related to Friday prayer.